The town of 11,500 inhabitants is situated in the region between the Danube and the Tisza, between Budapest and Kecskemét, along main road No. 50 in the region of the 68th km section, a few km from the geometrical centre of Hungary, 16 km north-east of Kecskemét (main road No. 5). Near its border you can see the ruins of the 13th century church of the village, which was destroyed in the Turkish occupation. The Farm Museum is situated at the border of Alsóbene, towards Kecskemét. Tourism started to develop with the opening of the museum. 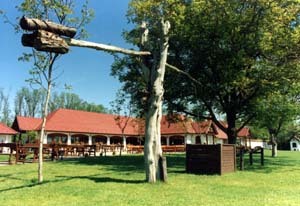 Right in the neighbourhood of the museum the Tanyacsárda (Farm inn) was built, which is famous in Europe for its high standard catering as well as for organizing various horse programmes. High standard catering and comfortable accommodation are offered by the Ricsovári manor and the Gerébi mansion, as well, where visitors can also enjoy swimming, playing tennis, riding a horse or riding in carriages.